From April to October, the Forest Hills Educational Trust offers a sampling of tours hosted by one of our local historians. 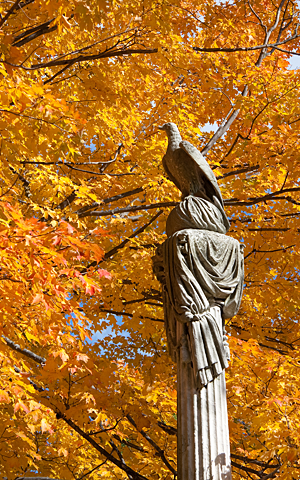 Ranging in topic and lasting about 90 minutes, these tours offer the local resident or distant traveler insight and history on one of Boston’s most beautiful and historically rich garden cemeteries. For a list of upcoming tours, see our Events and News page. Groups planning a self-guided cemetery visit are welcome during our normal business hours of operation. However, we ask that all large groups (over 10) register with us in advance of their intended arrival by calling 617 524 0128 and speaking to our tour coordinator. You may also send a tour inquiry from our Contact Us page. There is no fee for a self-guided visit. Garden of Memories, a fascinating guide book by Susan Wilson, contains six self-guided tours exploring different parts of the Cemetery. This book is available for purchase at the Cemetery Office. Once you are at the Cemetery, if you wish to visit a specific section or loved one, please stop into the Cemetery Office and we can provide you with a map and directions. 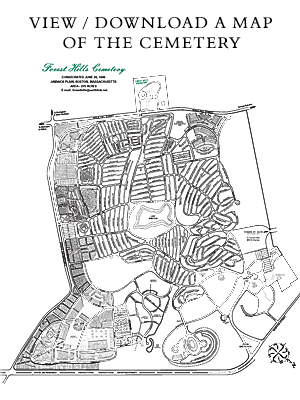 You may also view or download a detailed map of the Cemetery. The Forest Hills Educational Trust offers their Self-Guided Scholar’s Tour to enhance your visit. Please also see our Vistor’s Kiosk at the Cemetery for additional information. Private walking tours can be arranged with one of our local historians. These tours cover a variety of subjects and can be catered to your group’s interests. Tours cover approximately 1 mile of terrain, at times on an incline or uneven surfaces which are not suitable for those who may have difficulty walking. Please call the Cemetery Office at 617 524 0128 to learn more about arranging one of these tours.